I am a big Gary Chapman fan. I devoured his book, The Five Love Languages and try very hard to cater to the love languages of my family. Mr. Chapman's writing really helped me better understand the needs of my spouse, and that is a great thing! 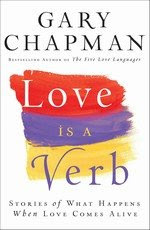 His new book, Love Is A Verb, is just as good as the first one of his I read. It is full of different stories of people who are remembering love is a verb. It is not just something you say, it is an action, something you do. I found the book inspiring and full of important life lessons. It points out that life can be full of ups and downs that test a person and their family. To survive the rocky road, we must see love as more than a feeling, but a choice. When we choose to love someone, we have to put effort into, not just say it. It isn't just a feeling, but an action that we must keep doing. I highly recommend this book. Gary Chapman reminds us all to love those around us; to really love them. What family can't benefit from a little more love?